The quick way to hang your lights. Simply attach the spigot to your light and the clamp stays permanently attached to your T-bar. - Universal lighting clamp. Narrow design fits between cross braces with ease. Lamp Leads & Accessories. Pro Audio & Lighting. DFB Sound & Light Warehouse Limited. When we have received the item back it will be checked to confirm the fault. The heavy duty pipe clamp from Showtec has an open base, suitable for M8 nuts. Maximum Load Capacity (SWL): 30 kg. Colour: Black. 66 x 170 x 33 mm. The heavy duty pipe clamp from Showtec has an open base, suitable for M8 nuts. Maximum Load Capacity (SWL): 30 kg. 0.345 kg (single unit). Material: Steel. Colour: Black. This bundle includes. 66 x 170 x 33 mm. 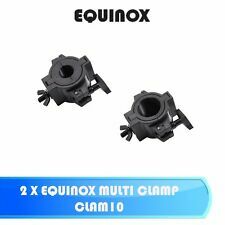 2 X RHINO MULTI CLAMP CLAM10 LIGHTING BRACKETS. Designed to quickly mount a light effect to a lighting stand and allow the light to be rotated 360 degrees. Max load bearing: 10Kg. Quick rigging of lights. Rhino Quick Clamp. The quick way to hang your lights. Simply attach the spigot to your light and the clamp stays permanently attached to your T-bar. Universal lighting clamp. Max load 10kg. Supplied in single units. A great performing clamp at a value price. This clamp, when used with the appropriate truss braces, will not let you down. Make sure to always make safety the first part of your show. If you don't have your pieces clamped down then you could risk everything. Will fit 50mm truss tubes. Hook for Lighting Effect. Strong, galvanised hook in straight version, suitable for lighting fixtures and projectors. 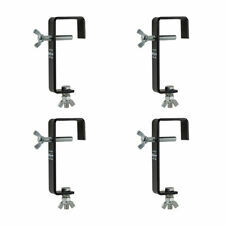 4 X RHINO MULTI CLAMP CLAM10 LIGHTING BRACKETS. Designed to quickly mount a light effect to a lighting stand and allow the light to be rotated 360 degrees. This is to help prevent credit card fraud. 8 x Silver 50mm Heavy Duty Hook Truss G Clamp, Lighting Theatre Disco DJ etc. The heavy duty pipe clamp from Showtec has an open base, suitable for M8 nuts. Maximum Load Capacity (SWL): 30 kg. Material: Steel. 66 x 170 x 33 mm. Colour: Silver. 4 x Rhino Quick Clamp. The quick way to hang your lights. Simply attach the spigot to your light and the clamp stays permanently attached to your T-bar. Universal lighting clamp. Max load 10kg. Supplied in single units. Type: 50mm Hook / G Clamp. Note: wing bolt design may change with batch. The heavy duty pipe clamp from Showtec has an open base, suitable for M8 nuts. Maximum Load Capacity (SWL): 30 kg. 0.345 kg (single unit). Material: Steel. This bundle includes. 66 x 170 x 33 mm. Colour: Silver. The quick way to hang your lights. Simply attach the spigot to your light and the clamp stays permanently attached to your T-bar. Universal lighting clamp. This is to help prevent credit card fraud. Key Points. The warranty covers manufacturer faults and does not cover misuse of the item, for example a 'blown out' speaker. How do I find the item number or product code?. Active PA Speakers. Need more information?. Active PA Speakers. How do I find the item number or product code?. Weight Load: 25kg. weight load: 25kg. Need more information?. What if I have not received my order?. When will I receive confirmation of my order?. Colour: Black. Active PA Speakers. What if I have not received my order?. When will I receive confirmation of my order?. Czech Republic. Speaker Hardware. Speaker Cables. weight load: 25kg. Can I reserve item(s) that I intend to buy later?. Active PA Speakers. How do I find the item number or product code?. Weight Load: 25kg. weight load: 25kg. Need more information?. What if I have not received my order?. Bright zinc plating to blend with polished truss. Suitable for truss/lighting bars up to 50mm Ø. Steel construction with tough plastic tightening knob. Our online presence were growing on a huge scale. Installation Speakers. What if I have not received my order?. When will I receive confirmation of my order?. Air Conditioners. Speaker Hardware. Speaker Cables. Power Supplies. Can I reserve item(s) that I intend to buy later?. F24 Half Coupler (32-35mm) (5036). This is to help prevent credit card fraud. Ultimax professional quality, heavy duty G clamp. To suit 50mm tube. Ideal for hanging lights and a wide range of other accessories. Drilled not punched. 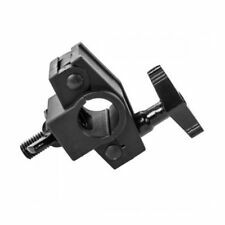 A strong, metal screw black G-clamp designed for secure fixing of lighting fixtures. 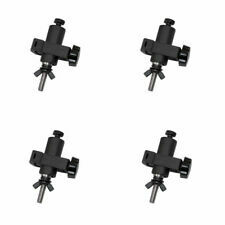 Whether you're a DJ or events, installation or hire company; these durable mounting hooks will secure light fittings onto stands and trussing; fitting to poles of up to 50mm in diameter. 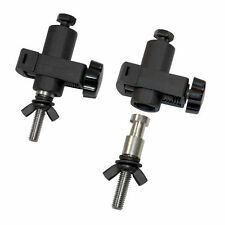 Great for stage lighting, DJ deck setups and events for disco lighting..
Superclamp for 48mm ~ 51mm Tube, Including Wingscrew, black Steel Finish. Useful if you are planning an event. complete with M10 nut, set screw and washer set. If we go wrong at any point, we would like the opportunity to rectify. 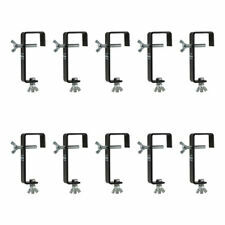 Light mounting hooks. Active PA Speakers. What if I have not received my order?. When will I receive confirmation of my order?. Speaker Cables. Studio Monitors. Power Supplies. Specifications N/A. The CLP-15N clamp from Chauvet is made of cast iron or aluminium works with their TUV-certified Truss pieces or wraps 360 degrees around pipe. Chauvet's new trussing system TRUSST encourages you to make safety a priority and recommends using the right clamps and cables for all applications. Order today and assemble a safe & sound set-up with this top quality product with a little help from us here at Electromarket..
A heavy duty G clamp for trussing up to 50 mm, featuring a locking screw and M10 mounting with washer, maximum load of 50 kg. Computer Accessories (23). S Shaped Light Duty Clamp for Bars up to 38mm. Suitable for truss/lighting bars up to 50mm Ø. Steel construction with tough plastic tightening knob. Our online presence were growing on a huge scale. Flight Case Hardware. Flight & Rack Cases. Lighting & Effects. Lighting & Effects. Deco Lighting. Active PA Speakers. Key Points. Live Sound & PA. Live Sound Accessories. The warranty covers manufacturer faults and does not cover misuse of the item, for example a 'blown out' speaker. A heavy duty G clamp for trussing up to 50 mm, featuring a locking screw and M10 mounting with washer, maximum load of 25 kg. Max Load (kg): 25. Net weight (kg): 0.8. A heavy duty G clamp for fixing to poles up to 50 mm, made from steel with fixings and a maximum load of 25kg. Suits: 50mm (2in) tube. Complete with Bolts and Wing Nuts. Our online presence were growing on a huge scale. Flight Case Hardware. Flight & Rack Cases. Over the course of 2015 DY Pro Cables quickly got a hugereputation for itself for providing high quality products on a very quick service. Quick and easy to attach, remove or re-position of your light. A 3-year warranty is promised, your satisfying is our ultimate pursue. - Quick and easy to attach, remove or re-position of your light. Hook for Lighting Effects. 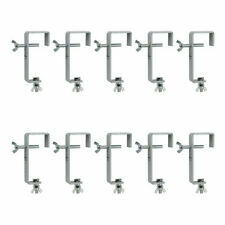 Strong, galvanised hook in straight version, suitable for lighting fixtures and projectors.